Bananas are a source of FOS – this is a prebiotic that helps probiotics thrive and boosts the absorption of B vitamins and mineral absorption. I usually throw 5-6 banana’s into a freezer bag at the start of each week, keep them there for convenience. You can add many different flavours raw cacao, nut butters, pumpkin puree, applesauce, vanilla powder, cinnamon, ginger, allspice, cardamom,bee pollen, coconut butter – the list is endless and your taste buds are the playground for this exciting recipe. 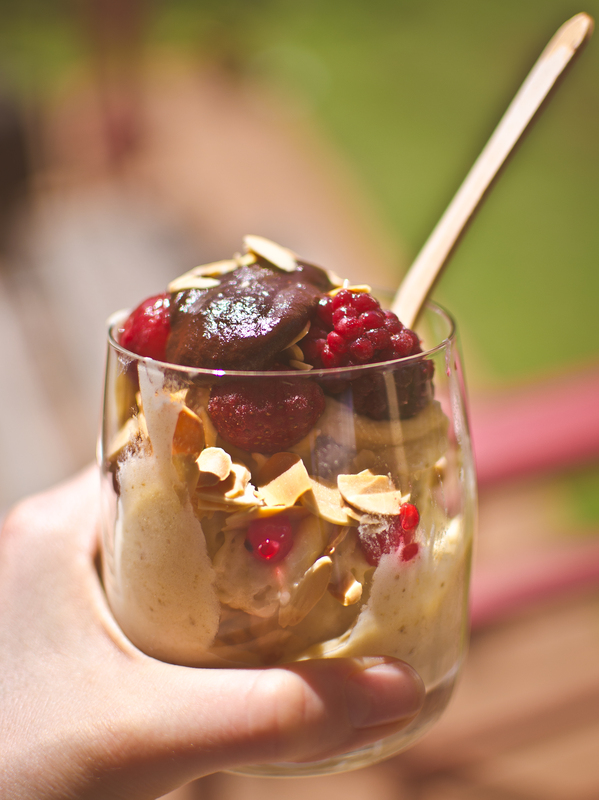 I made a fudge sauce to swirl through my banana soft, toasted some almonds and tossed in a few frozen berries. The recipe is gluten-free, grain free and dairy free. The only sugar present is fruit sugar. Always remember to eat in moderation. You will need a food processor to make the banana soft serve. Pit and chop dates. Blend dates and coconut milk together. Pour into a small saucepan and heat on medium temperature, add coconut oil and raw cacao powder. Stir until combined, remove from heat. Pop in a glass jar or serving bowl until ready to serve. I added tablespoon to each glass. If you have any left over store in an airtight container in the fridge.Toast flake almonds under the grill until golden brown. 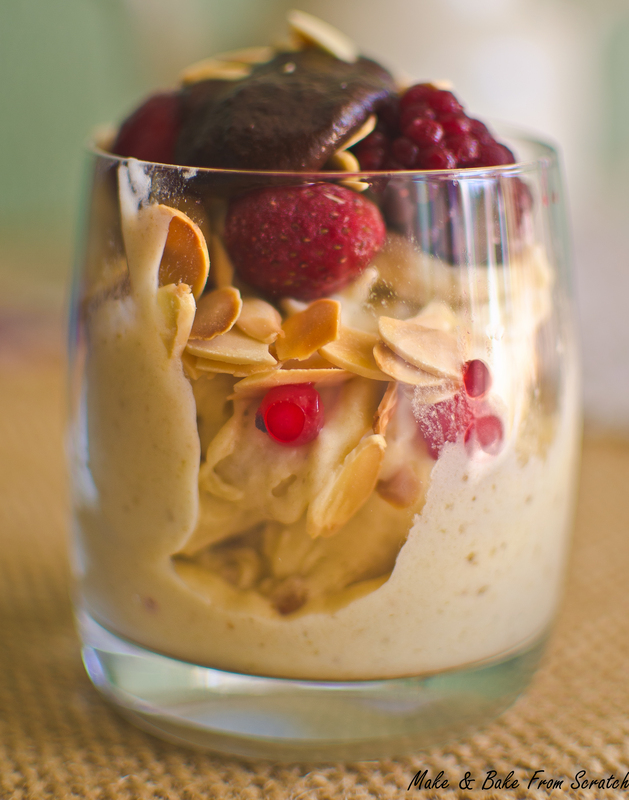 In a food processor add frozen bananas and vanilla powder. Blitz the frozen banana until it is well-combined and resembles an ice cream consistency. As you can see from the images I layered mine in a tumbler glass. Feel free to eat your creation whatever way you like. Love your pictures! 😉 So happy I found your blog. It was mentioned in my google alert about Superfood! so cool!